Thermography Studio™ is a feature rich, real-time image capture and thermal analysis software for the TVS200/500 line of infrared cameras. 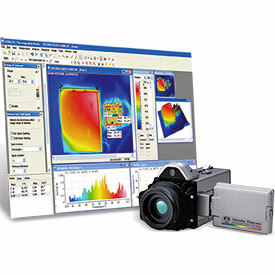 Thermography Studio features a highly intuitive user interface and a library of powerful tools that enable the sophisticated analysis of thermal behavior for a wide range of objects and materials. Thermography Studio features powerful real-time analysis tools including spot meters, line profile, area analysis and isotherms. Unique object parameters (emissivity, background temp) can be set for each measurement tool. The TVS camera's IEEE 1394 digital output is displayed in real-time on your PC for analysis or recording. The sequences can be easily converted to an AVI file suitable for Windows Media Player. Image recording and playback mimic standard VCR controls and camera control dialog boxes are easy to understand. The highly integrated explorer file view makes it easy to organize your work, while the highly advanced built-in report generator enables you to quickly create detailed reports with a few simple mouse clicks.